This vessel sustained damage from Hurricane IRMA, and has been deemed repairable by the surveyors. The pictures in the vessel are from before the Hurricane. Please contact your Moorings Broker for more detailed information and details on the repairs. BUILDERS REMARKS: The Leopard 46/Moorings 4600 is the accumulation of 30 years charter experience by the Moorings and 500 catamarans built by Robertson and Caine. 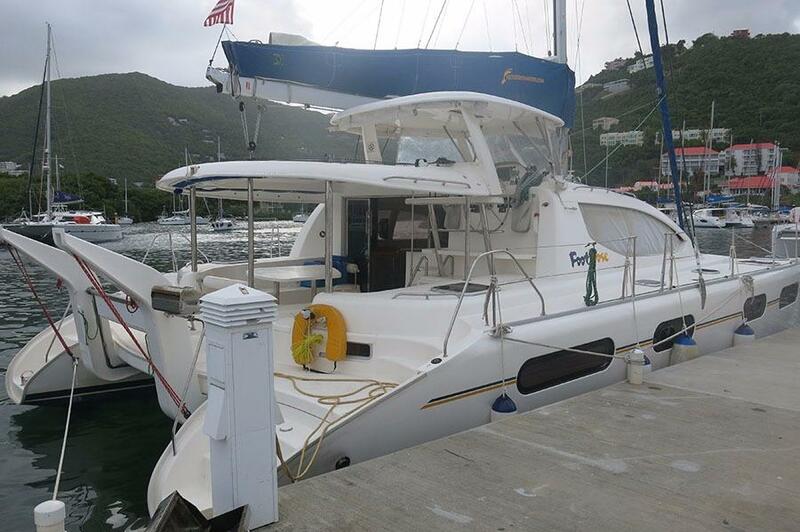 No other mid forty foot catamaran matches the interior space, walk around beds, separate stall showers with excellent sailing performance and ease of maintenance. BROKERS REMARKS: CATALINAVILLE is a simply fantastic Leopard 46. Fitted with large Yanmar engines she drives into the weather effortlessly. This 2010 model has helm steps from cockpit for easy access, with space to fit a cockpit fridge below. The aft deck bench seat that becomes a swim/dinghy platform for easy water access and even fishing. North Lights generator, air conditioning and a fresh airy interior. Make an appointment today. AVAILABILITY: Due to be released from the Moorings/Footloose fleet on 30th June 2017. Possibility of early release. Contact us call for details and availability.